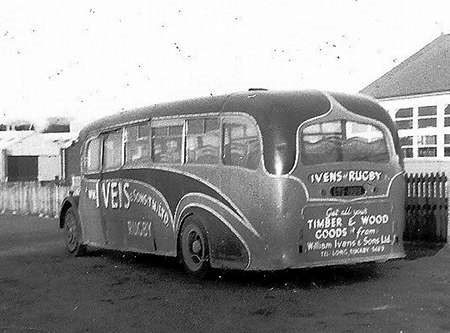 William Ivens and Sons (Timber Merchants) Limited of Rugby had in 1961 a works service from the Long Buckby, Northampton direction into Rugby and the bus was usually was parked up nightly in the Corporation Street car park. The two shades of blue Crossley SD42/7 with Yeates C35F body had been new to Hirst & Sweeting of Sheffield in 1949 (who were to sell out to Sheffield United Tours in 1967). LWE 669 also so spent some time with KW of Daventry after it left Sheffield; other than this, little else is known? LWE 669 was new in 06/1949. It was sold in 04/1954 to Oliver Luxicoaches Ltd of Loughborough. It then passed to KW Coaches Ltd of Daventry as number A4 in 01/1957. 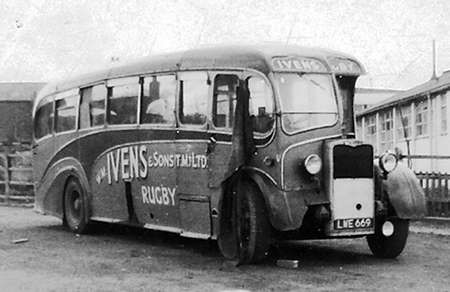 It was withdrawn in 06/1959 and sold to Ivens & Sons of Rugby. Last licensed 12/1962. I was sure someone somewhere would know its history. Although Northampton were well known for their liking of the Daimler/Roe combination, in the 1930s they had purchased several batches of Crossleys, so perhaps it is not surprising that they purchased a batch of ten DD42/3 chassis with Roe bodies in 1946. One of them, fleet number 146, VV 9146, has survived into preservation and is seen here in Great Houghton on an Heritage Weekend service, 9/9/17. To put it mildly, this was a heap of junk before the present owners (one of whom is a former Crossley employee) started work on it. The dedication involving in restoring it to its present condition is unbelievable. It has to be said though, it isn’t very fast! Two Crossleys in succession is quite a treat. Greatly enjoyed Peter W’s Youtube link, where the induction noise is more noticeable than on the Reading Crossleys, but the gearbox music is just the same. 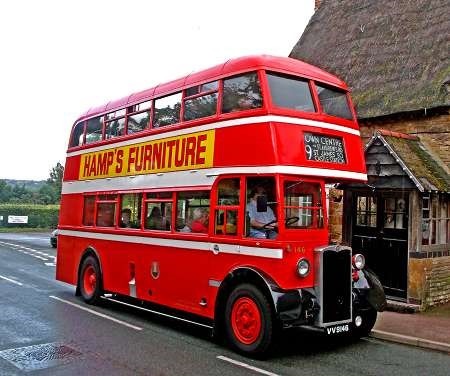 Superb piece of restoration, this Northampton bus. One of my very favourite bodies on what—despite its engine woes—is also a favourite chassis. Nice steering, brakes and clutch, dead easy gearbox. A real pity that the management didn’t fork out and pay Saurer the licence fees, but even then the weak crankshaft would still have posed problems, and the much lighter Morris-Saurer engines fitted to Hants and Dorset’s Morris-Commercials were apparently not that successful. I remember seeing them at Lymington, but never got a ride. Do any MC-Saurers (from any operator) survive? I recall going into a shed in the 1980’s,which was part of Botley’s Park Hospital, Ottershaw, Surrey (which, like many mental institutions, had a farm, but long closed by then). I found three old vehicles in there, two complete and one being just a chassis, with Armstrong-Saurer on it. It looked more lorry than bus, but who knows. I reported them all to a vehicle preservation organisation and six months later, all were gone, but to where? So Saurer vehicles were made here on Tyneside for a period, from 1930-1937, according to Grace’s Guide. The Swiss firm of Saurer had a modest impact upon the British automotive industry. In the late 1930s the Crossley company embarked upon the design of a completely new passenger chassis that was to become the DD/SD 42. The company’s Chief Engine Designer, W.C. Worrall, was then diagnosed with tuberculosis, a very serious disease at the time, treatment for which entailed taking up residence in a completely unpolluted atmosphere. Industrial Manchester fell somewhat short of the qualities sought from a health resort, and Worrall was sent to recuperate in Switzerland, where he had worked previously for Saurer. Whilst there he visited the works of his former employer and was thereby stimulated to incorporate features of the Saurer four valve cylinder head design in his new Crossley HOE7 engine. The sad subsequent story of what happened later after Worrall’s return to Manchester, when Crossley Motors MD Arthur Hubble refused to pay a Saurer licence fee, is well known, and therein lay the essence of the company’s decline and demise. The only link between the Morris Commercial built Saurer diesel engines of 1948 onwards (which intimately became the Leyland 4/98 and 6/98 ranges) and the earlier Armstrong Saurer range of lorries was the licensed manufacture of engines to Saurer design. The Armstrong Whitworth saga is rather complicated. In 1904, Sir W.G. Armstrong Whitworth (primarily an armaments and shipbuilding company) took over the manufacture of the Wilson-Pilcher car which continued to be available until 1907, but the firm introduced its own car and commercial models from 1906, powered by engines between 2.4 and 7.6 litres. About 20 Armstrong Whitworth 32hp buses were delivered in 1906 to the Motor Omnibus Company of Walthamstow, better known by its trading name of Vanguard. This chassis type, which had a four speed crash gearbox and chain final drive, was also available as a three ton lorry, later uprated to four tons. By 1914 a one ton van with worm final drive had been added to the catalogue (figures refer to the payload, not, as today, the gross vehicle weight), but the firm’s commitment to automobile production was less than wholehearted. During the Great War Armstrong Whitworth concentrated on ships, armaments and aircraft – the aeroplane division was formed in 1912 – and from 1919 adapted its Newcastle Scotswood works for a determined assault into railway locomotive and road roller manufacturing. In 1927 Armstrong Whitworth merged several of its engineering interests with Vickers, when the aircraft and motor divisions of the former AW concern were sold off to J.D. Siddeley as Armstrong Siddeley. (Vickers already had its own aircraft manufacturing arm.) Armstrong Whitworth had earlier entered into a licence arrangement with Saurer of Switzerland in 1919 for the manufacture of diesel engines which were first fitted to diesel locomotives and railcars, but, in 1930, the firm decided to re-enter the automotive market with the Armstrong-Saurer range of lorries built at Scotswood. These massive looking, normal or forward control machines were available with four or six cylinder indirect injection engines coupled with four speed gearboxes in four, six or eight wheeled versions. Air brakes, overdrive or Maybach auxiliary gearboxes and double reduction final drives were optional. The main emphasis was on the diesel engined models which had names beginning with the letter ‘D’ (Diligent, Defiant, Dauntless, Dominant, Durable, Dynamic, though later models were called Active, Effective and Samson), the much rarer petrol versions using ‘P’ as the initial letter (Pioneer, Persistent, Powerful). Very few were bodied as buses or coaches, but, in 1932, a 13ft 2ins wheelbase, normal control Dauntless with the 6 cylinder diesel of 8.55 litres, producing 90 bhp at 1800 rpm (the alternative four cylinder engine developed 52 bhp from 6.8 litres) was fitted with a luxuriously appointed Ransomes, Sims and Jeffries single deck body for demonstration purposes. In 1933, Armstrong -Saurer declared that it was considering entering the single and double deck passenger vehicle market, but later that year the Armstrong-Saurer diesel engines were offered as options in the Dennis Lancet and Lance chassis. New direct injection versions of the Saurer engine appeared in 1934, a 5.7 litre four cylinder of 70 bhp and a 8.55 litre six of 120 bhp at 1800 rpm, and ten single deck Daimler COS4 and one double deck COS6 thus powered were delivered to Newcastle Corporation in 1935. They were converted to AEC engines during WW2. In 1934 Dennis produced its own direct injection four cylinder O4 diesel of 6.5 litres, which, like the Saurer, had four valves per cylinder, though the design must have differed from the Saurer patents because no license fee was ever paid by the Guildford firm. Despite its premium prices, the Armstrong-Saurer range earned a solid reputation with hauliers for quality, but sales were a struggle in the depressed 1930s. Railway locomotive production was also in decline, and the Scotswood workforce fell from some 3000 in the early 1920s to just 500 by 1935. Rumors concerning the future of Armstrong-Saurer production at Scotswood began circulating in that year. Despite official denials, these proved to be well founded, and the entire Armstrong-Saurer range was withdrawn in 1937 when the Admiralty bought the Scotswood works and leased them back to Vickers-Armstrongs in order to concentrate on military work in the rapidly worsening political climate of the period. I have challenged before, and will challenge again, the widespread notion that Crossley failed because of its engine problems. In the early postwar years, Crossleys sold as well as they did because there was a high demand for buses. When they became part of the ACV group, AEC engineers quickly sorted out the HOE7 engine, and if the demand had still been there, word would have got around and they would have continued to sell. But the fact is that the bottom dropped out of the bus market in 1950, resulting in over-capacity in the industry, and in that situation Crossley were uniquely vulnerable because buses were their only product. Daimler made cars, Bristol were protected by a guaranteed market, and every other bus manufacturer was also a lorry builder. 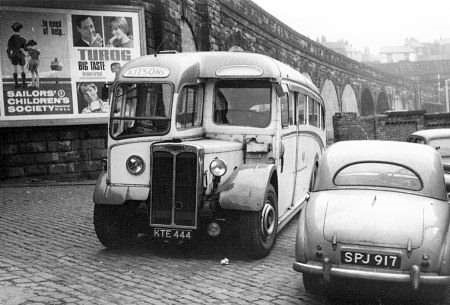 Crossley were totally dependent on the shrunken bus market, and that is why they failed. The Crossley DD/SD42 was a very sound chassis design, but quickly revealed deficiencies in the engine department and in its steering, which was very heavy. In the immediate post war period the demand for passenger chassis was exceptionally high, and, on the strength of the performance of the HOE7 ‘Saurer head’ engine, orders for Crossley chassis poured in. 3119 chassis were built between 1945 and 1951, but the concentration of production was in the years before the weaknesses of the HOE7 engine became widely apparent. It is true that the demand for new buses fell off sharply after 1949, but I maintain that the poor reputation of the engine did contribute to the decline of the Crossley Motors company, particularly in the double deck field. Somewhat surprisingly, since Crossley had not been a significant player in the pre war coach market, the single deck SD42 sold quite well to independent coach firms, whose operations were less punishing than all day stop start work on heavily laden municipal bus routes, and whose drivers tended to be rather more respectful towards their machinery. The Crossley Motors board did read the market trends accurately from 1945, and seeking a more secure foothold, entered into negotiations with Maudslay in 1946, which dragged on into 1947 when AEC expressed an interest. In 1948 AEC took control and began reshaping the business in line with its own procedures, which were not entirely to the liking of the Crossley directors and employees. There is surely no doubt that the long term continuation of independent Crossley models was not part of the AEC plan. In the meantime, early purchasers of the DD42 were becoming more than a trifle disenchanted with their buses, and did not offer repeat orders. Notably Manchester, potentially a very valuable customer, did not come back again after its 1946/47 deliveries. Stockport, in whose area the Crossley new Errwood Park factory was located, strongly resisted taking any more vehicles from the firm, but eventually and reluctantly conceded another order after a rather suspect tendering process in which Crossley slightly undercut Leyland. Yes, in frustration over Crossley’s lack of progress in sorting out the HOE7’s problems, AEC did come up with the downdraught engine, but hardly quickly, for this did not appear, and then only spasmodically, until 1950, by which time the Southall die had been cast against the passenger vehicle dependent Crossley marque. I remember visiting a bus museum near Hall i’ th’ Wood in Bolton some time in the mid 1980s and a Northampton Crossley was one of the buses there, in unrestored condition. I don’t know which one it was, could it have been this one? Only just seen your post of 1/11/17, Roger. Although you only mention the directors of Crossly, Roger, I can only assume the Arthur Hubble was still there after the AEC takeover, since I recall you saying elsewhere that he caused friction with Gardner’s management at much the same time. I’m surprised that the senior management were allowed to stay when AEC took over, but, perhaps, it was more common then. Nowadays, they go willingly with a good handout, but then it was less likely, I imagine. But I’m sure in the bus industry, that Hubble’s truculent and mean-spirited attitude was well-enough known to have justified arranging for his rapid departure! Only really of relevance to those close to Colchester, a former Crossley employee (and joint owner of VV 9146) will be giving a talk on Feb 9th about his time with the company which promises to be very interesting. I doubt that there are many ex employees still around given how long it is since the company’s demise..
Chris, all the original Crossley Motors directors were of advancing years by 1948. Sir Kenneth Crossley was almost 70, Arthur Hubble 60, T.D. Wishart (chassis designer) retired in that year, Major Eric Crossley retired in 1948 and died in the following year. No doubt AEC retained the residual management at Crossley to see out the production of existing models, which, hopefully, faced a better future with the AEC designed downdraught engine of 1949. AEC’s longer term plan for Crossley can be only conjectured, but I doubt that the Stockport firm was seen as a continued supplier of complete vehicles in a declining market. As with Leyland then and later, the absorption of other companies was an exercise in reducing competition as much as expanding productive capacity. Thx, Roger. One wonders if the improved engine stimulated demand for a period. Whatever happened, at least the profits went to AEC. I see that we get again that all the Leyland closures were to reduce competition- try amending that to reducing losses and concentrating investment to compete against the rest of the world-which we still failed to do. Thanks again to Nigel Turner for mentioning Tony Melia’s talk on his time at Crossley Motors. Spellbinding! Not just Tony’s perfect recall of the works and vehicles, but a wonderful insight into how apprentices were treated in those days, how fairly inexperienced workers were expected to use their initiative to get round any problem that might crop up and—of course—a total lack of Health & Safety. Some good character studies, too. Plenty of laughs. Any Bus Enthusiasts’s Society lucky enough to secure Tony Melia for an evening has a real treat in store. It was good to meet Ian Thompson at Colchester and I’m glad he enjoyed the talk by Tony Melia, actually I’m sure that everybody there did so. Despite being in his ninetieth year, Tony spoke fluently for two hours which is no mean feat. Some of his stories about road testing the bare chassis over the Snake Pass make you wonder how he survived to his thirtieth birthday let alone his ninetieth.